For weeks, it’s been hard not to slam on the brakes driving by in.gredients in east Austin. Their Carolina jessamine, aloe maculata, and globe mallow rival any speed bump. When I stopped by, I could smell spring from a block away, thanks to Carolina jessamine (Gelsemium sempervirens). The bees were way ahead of me. Daphne makes this evergreen native vine her Plant of the Week for its deer resistant, drought defiance to screen a fence, drape a trellis or even cover the ground! Mexican honeysuckle (Justicia spicigera ) is not a vine, but it’s a great perennial for shade. Mine didn’t totally freeze this year, so it’s hard to clip them back while they’re sparking pollinator attention. I’ll do it this weekend, though, since we’ll all be better for it. And wouldn’t you know it. My fall-planted ‘Rainbow’ shrimp plants bloomed now! I can’t decide if the bracts look like Donald Duck or a dragon, where the tiny flowers inside the “tongue” entice hummingbirds. I went ahead and clipped them since they’re adolescent scrawny. Bees are all over the redbuds in town, including my Mexican redbud. Mountain laurels have never been so spectacular, but Alison Hammerbacher has a problem on hers. This week, Daphne explains that this damage is probably due to an insect last year, which destroyed the chlorophyll in those areas. Otherwise, the tree is healthy, so no reason to worry. Do be watching for the Genista caterpillars in the next few weeks. An infestation can wipe out a young mountain laurel in no time. Spray the leaves with Bt (Bacillus thuringiensis). Or squish! 50 shades of purple arrived last week on my native perennial spiderworts (Tradescantia gigantea). They cross pollinate with ease to surprise me every spring with their seeded out progeny. Lavender plant is by far one of the most treasured scented, beneficial plants. But it sure is tricky to grow! This week, Rose Eide from Lampasas Ridge Lavender Farm joins Tom to ramp up our love of lavender with the secret to success. Sun and perfect drainage are critical. If you don’t live in the Hill Country, mound up decomposed granite, and don’t plant alongside your roses! For culinary use and sachets, Rose goes for ‘Provence’. It’s perfect in deer country since it’s so high in camphor that they steer clear of it. But all lavender is deer resistant. Plant ‘Grosso’ if you only plan to craft. And here’s phenomenal news for those of us in high humidity, including new lavender growers in Louisiana and North Carolina): the variety ‘Phenomenal’. Keep an eye (and nose) out for it. Spanish lavender does well for many of us, but its role is to support bees and entertain our eyes. It’s not aromatic enough for crafting. Check out Lampasas Ridge Lavender Farm to meet Rose at events this spring. Plus, she’ll be at the truly phenomenal Texas Master Gardener Conference in Belton. From April 16th – 18th, they’ve got incredible speakers, vendors and much more. Get all the details. Lavender doesn’t need much water, but those vegetables and others can use a little help. This week, garden designer Colleen Dieter joins Trisha to demonstrate DIY ollas made out of clay pots! The Spanish word for “pots,” ollas are a traditional way to slowly seep water to your plants. You can even add compost tea or other nutrients to the water when you fill them. See how to do it! Even as we’re hauling plants of the garage or other protective hiding, so many people vow to build a greenhouse next year. To inspire your vision, our Viewer Picture this week goes to Susan Tomlinson, who built this kit greenhouse in Lubbock. Check out her beautifully written blog, The Bicycle Garden, to see how she did it! 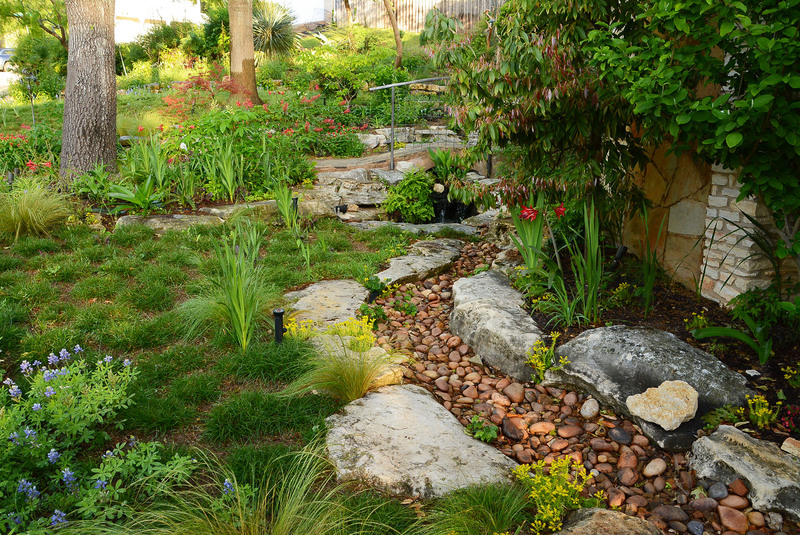 On tour in Temple, Bell County Master Gardener Mary Lew and David Quesinberry replaced most of their lawn with deep dimension. That red-leafed tree is ‘Forest Pansy’ redbud. Close to the house, enter their arbor into a shady retreat, comfortable even in summer. Sit a spell and have a drink on their stone table. Or picnic closer to musicians that never take a break. Not water-babied lawn softens sound and heat and carpets the ground for grandkids to lie around and look up through the trees. We all need a practical place to store all our garden stuff. Mary Lew and David charmed theirs up. In back, move into sun where they built up well-draining beds for mostly native plants. To change the formerly flat viewpoint, they hauled a lot of boulders! Hesperaloe parviflora ‘Yellow’ pops up against nolina and bluebonnets. Small native tree, fragrant mimosa (Mimosa borealis), is rich in nectar for wildlife, but deters deer. In front, they continued their destination theme. And they lucked into old hitching posts to anchor the sidewalk entrance, instead of horses, these days. That’s ‘May Night’ salvia blooming to the left.